I've become more and more attracted to games that streamline gaming to it's essence; graphically and gameplay-wise. 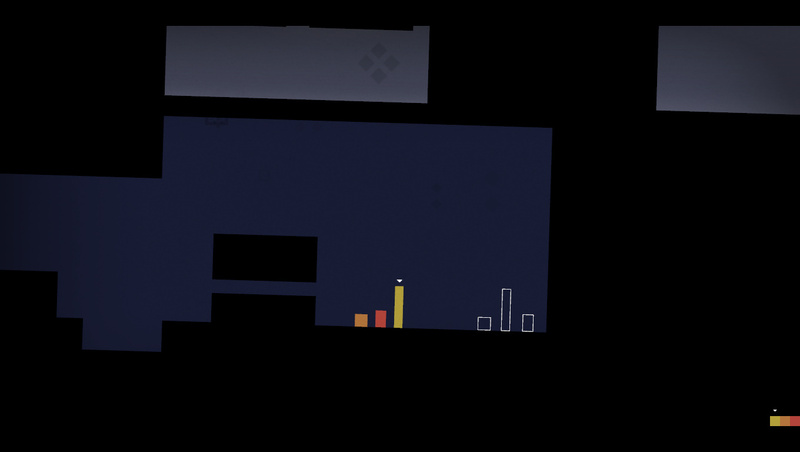 Mike Bithell's "Thomas Was Alone" does just that so I've been interested in this one since before the release. The graphics are done with love but kept simple - no textures or special effects, the characters are reduced to rectangles - the gameplay is equally simple : guide the rectangles to their respective exits, using their special abilities to overcome obstacles and puzzles. There are only two buttons: jump and change character. The amount of challenge and the length (under 4 hours) was a really nice fit for my gaming personality at the moment aswell - I need more memorable 4 hour experiences and less 40+ hour bores. All of this means that there is no distraction. You can concentrate on the story, which forms slowly through the stellar commentating by British comedian and writer of Yes Man, Danny Wallace. The game is so touching and just feels comforting as you play it, it's not asking too much of you, you can play it with your kids - my daughter was always asking "What's that one called?" and "Is he alone too?." For me it brought out feelings I had about gaming as a kid, especially when it comes to graphics: they don't matter it's all about character - that little pixelly Mario had so much character in my mind and so do Thomas and his friends. Looking at the fan response online it looks like I'm not the only one who thinks so.